Trailhead and parking area are on Rt. 16 in Martin's Location, NH (summit is Bean's Purchase). Look for a hiking sign for Imp Trail in a small pull-off 5.4 miles south of Rt. 16's eastern junction with Rt. 2 in Gorham. 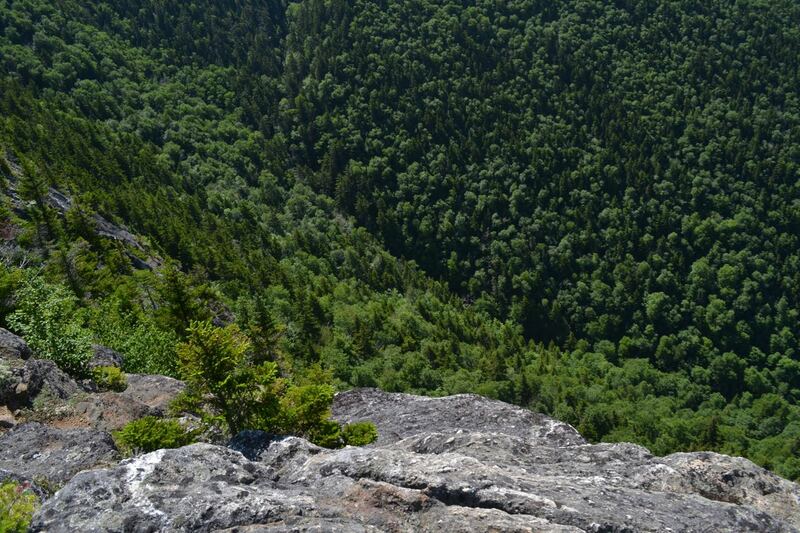 This impressive cliff on the side of North Carter Mountain provides stunning views of Pinkham Notch, Mt. Washington, and the Northern Presidentials. It also has what is probably the best view of the Great Gulf from afar. Standing on the cliff is quite amazing as well, as there is a sheer drop of several hundred feet on two sides. The north branch of the Imp Trail reaches this spectacular destination in a fairly short but arduous hike of 2.2 miles. From the parking area, the Imp Trail climbs a staircase into the woods, passes a kiosk, then crosses a power line clearing. It ascends gradually through an open hemlock forest. Soon, Imp Brook is seen in a valley to the left. After a mostly easy walk of 0.8 miles, the trail passes a small cascade and crosses the brook. On the other side, it steepens for a 300-foot climb, then becomes flat, leading slightly downhill for a short distance. As the trail again becomes steeper, it heads toward the north side of a ridge, which it follows for most of the climb. One wooden ladder is encountered in this section. Climbing remains constant until one mile from the Imp Brook crossing, where the trail makes a sharp right turn and ascends over ledgier terrain. It soon switchbacks again and continues along the side of the ridge. As it nears the Imp Face, the trail turns right and runs flat for a short distance before scrambling out onto the open ledges, 0.4 miles from the sharp right turn. Walk to the far side of the cliff for the best view. Above you is the high ridge of the Carters. Below is the valley of Imp Brook, hundreds of feet straight down. Wildcat Mountain rises above a ridge of South Carter Mountain, with the ski trails on Wildcat D seen behind Little Wildcat Mountain. Wildcat's slopes descend to Pinkham Notch, where you can see Rt. 16. Through the notch, you can see Rocky Branch Ridge, which rises to Slide Peak. The ridge continues up to Boott Spur, then Mt. Washington. Next over are the four great Northern Presidential peaks: Mts. Clay, Jefferson, Adams, and Madison. Below them is the massive cutout of the Great Gulf. To the right of Madison, you can see the Crescent Range, with the Pliny and Pilot Ranges behind.